lot of information, I can't figure out what kind of model it is". There doesn't appear to be many 1936 parts on this car. The headlights, maybe? The frame? 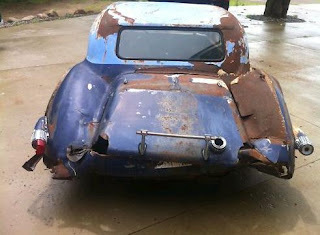 Based on the rust, the body is metal. It's impressive looking, in a weird sort of way. 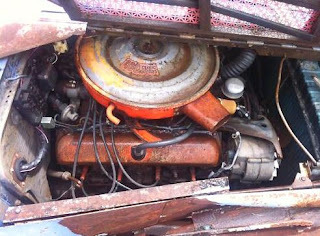 The engine is a 400 ci Oldsmobile V8. To the best of my knowledge, these were built from the mid to late sixties. 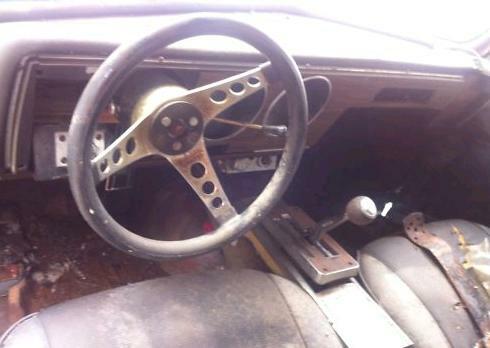 The seller says it has a standard transmission, but the shift gate sure looks like it's from an automatic. The dash is late sixties / early seventies GM. This is not my type of car, but if you're into American cars / hot rods / homemade cars and MASSIVE projects, it may be worth taking a look at. It appears as if it's being offered without a reserve. Located in Bethel, MN, click here to see the eBay listing. 2) Looking @ the ebay photos, this was a hand built, 2 tone, home-made "thing"
3) My thought: bits of 1936 car (hood, passenger compartment, tail) on a mid 60s frame with mid-60s interior and running gear? 4) People are bidding on this! I'm not sure if the chrome towel bar on the trunk lid is a backyard attempt at a bumper, or a "luggage rack." I think it would be hilarious if the production team of Top Gear USA called the snobs at Pebble Beach (or Amelia Island) and attempted to enter this as some sort of recently discovered Figoni et Falaschi vehicle. The rear window is held up with a shelf bracket. I think I might actually love this car, but I can't be sure. Wait...It says it has a manual transmission, but it looks like a GTO "His and Hers" shifter. Hmmmm. I like the way that the builder minimized the air intake by roughly half with the bodywork behind the front bumper. I'm wondering if those holes on top of the hood were made after the radiator boiled over. The perforated sheet metal behind the holes (visible in the motor photo) is straight from the hardware store. I also really like how the steering wheel lines up with the dash. 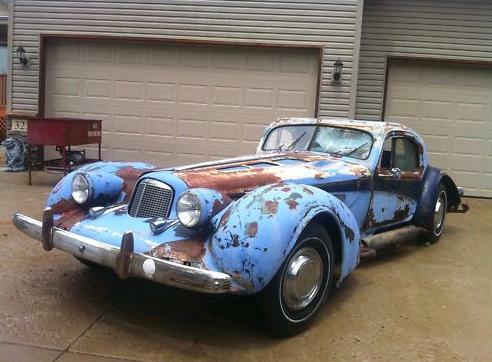 If someone managed to get this running, it could be a winner in any "Rat Rod" beauty contest. This somehow made its way to France. It is now being offered at €20,000, which is roughly $27,000!